I found this Ford Powermaster diesel tractor in the middle of an industrial area west of Salt Lake City. I decided a field and trees would make a better background than shipping containers. The title "In Da Weed's is a play on the slang used to describe the low stance of a custom car. 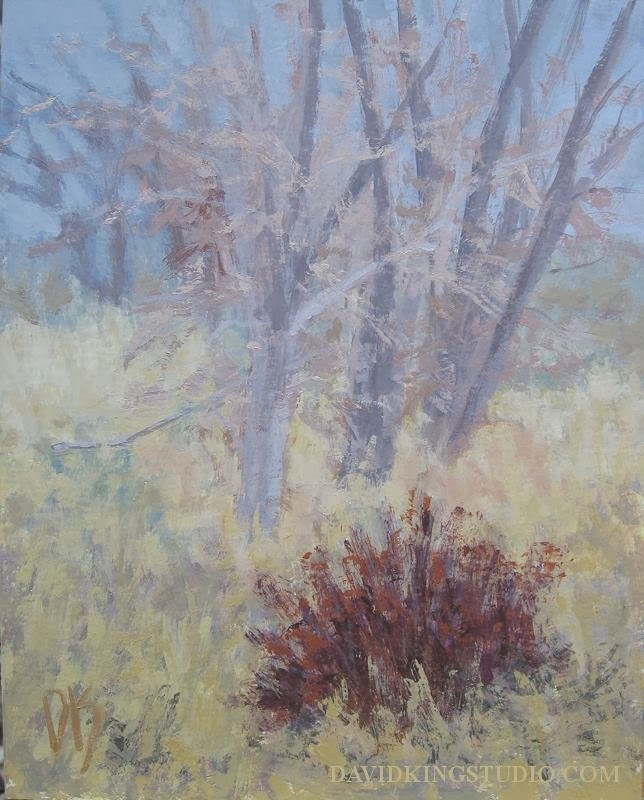 Acrylic on panel, 8" X 10"
I really feel for you folks in the eastern U.S.. Back in December Northern Utah was in the deep freeze with low temps that are rarely seen here, I was afraid we were in for a long, frigid winter. While the winter has continued to be extreme in the East, Utah started warming up in January and for the most part we've been warmer than normal, I can't complain. However, I just feel bad for those of you who just aren't getting any breaks from the heavy snow storms and sub zero temperatures. Hang in there guys, spring is on it's way......eventually. Today was typical gray, gloomy overcast winter day here in the Salt Lake Valley....except that it was warm, in the high 50's even. Normally it's very difficult for me to feel motivated to paint outdoors without some sun but I felt I better take advantage of the warmth and get out there. 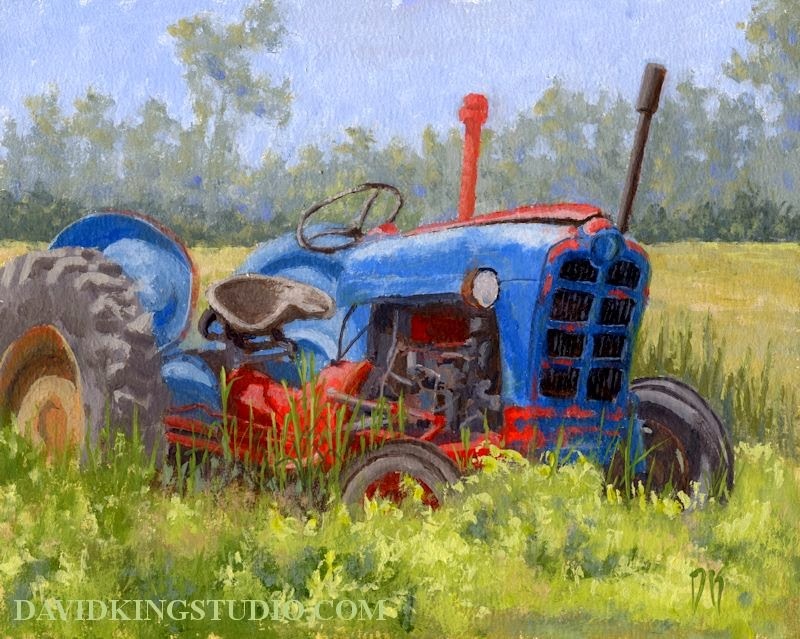 I drove just a short distance to the Jordan River Parkway to paint this little study. 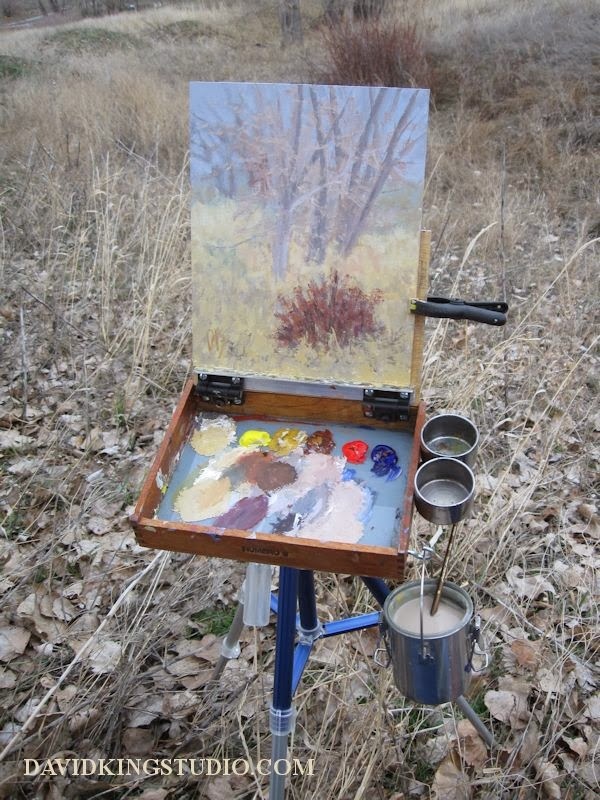 I had the presence of mind to take a couple photos of my plein air painting set up for small paintings. In this photo you can see everything I take with me out to paint for 8" x 10" and smaller paintings. Everything but the chair fits in the backpack that's sitting under the brush holder. The plastic box is just something I picked up at the local grocery store and is just the right size to hold a few tubes of paint, a view finder, a couple pencils, a palette knife, medium cup and small spray bottle, (which I forgot to pack today, good thing it wasn't too warm!). Here's a close up of my home made painting box. I started with a cigar box I bought at a yard sale for a quarter. The original box hinges were removed and replaced with resistance hinges. The screws that hold the hinges to the lid also hold a piece of aluminum angle that provides a shelf for the painting to sit on. I use a little spring clamp to hold the painting to the lid. There's a piece of bent sheet aluminum attached to the right side for medium cup to be clipped to. A hook is also screwed into the right side to hang the solvent can on. I cut a piece of glass to fit the bottom of the box, painted the back side gray and glued it in for my palette. I installed a 1/4-20 nut insert into a piece of 3/8" plywood and glued that to the bottom of the box to allow the box to be mounted to a tripod. 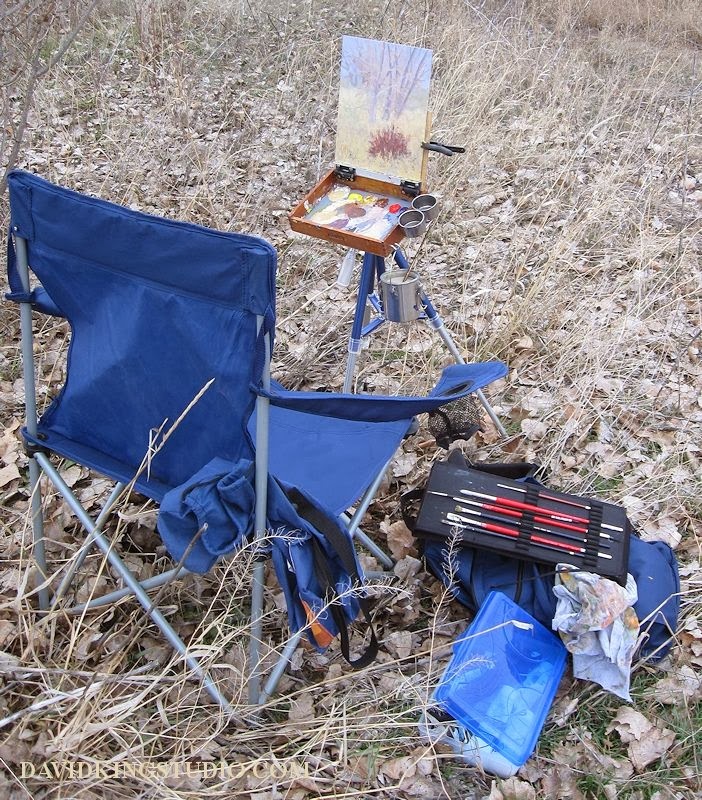 There you have a it, a home made plein air painting setup that's about as thrifty as it gets. All three of these paintings have something in common, they are the same basic composition. The foreground is a field, bushes and trees constitute the background with a structure in the upper right quadrant for the focal area. This is a very simple idea but ripe with many possibilities. As you can see each painting is very different in spite of being built on the same idea. The main difference is each painting represents a different season. 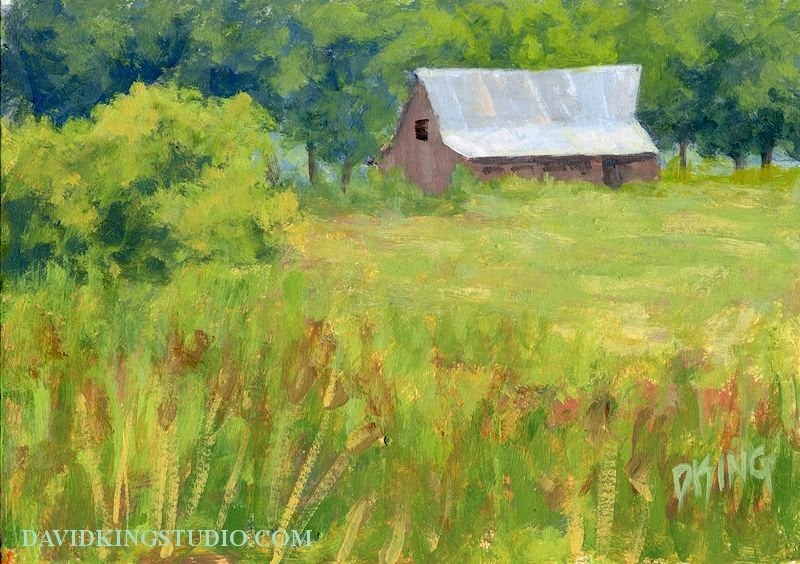 In "June Field" is represented the transition from spring to summer, every thing is still a very vibrant green. 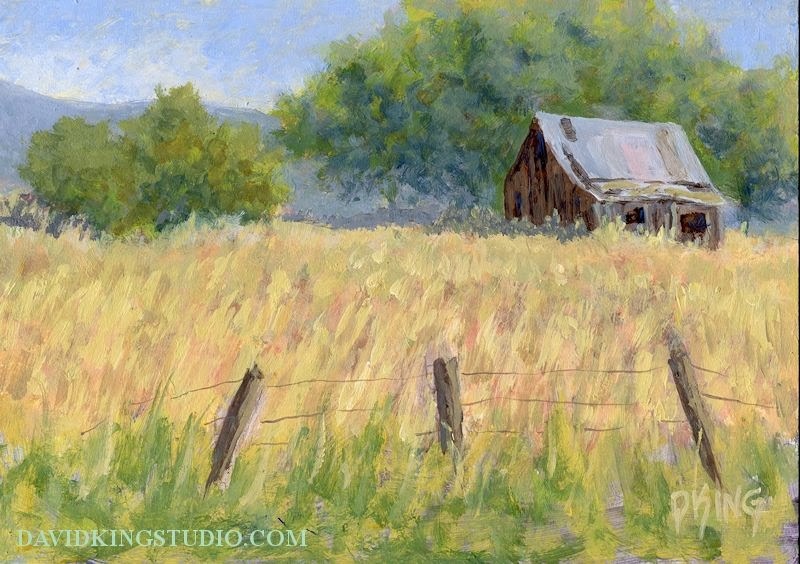 In "August Field" the late summer grass has turned yellow and the greens of the trees and bushes much more muted. 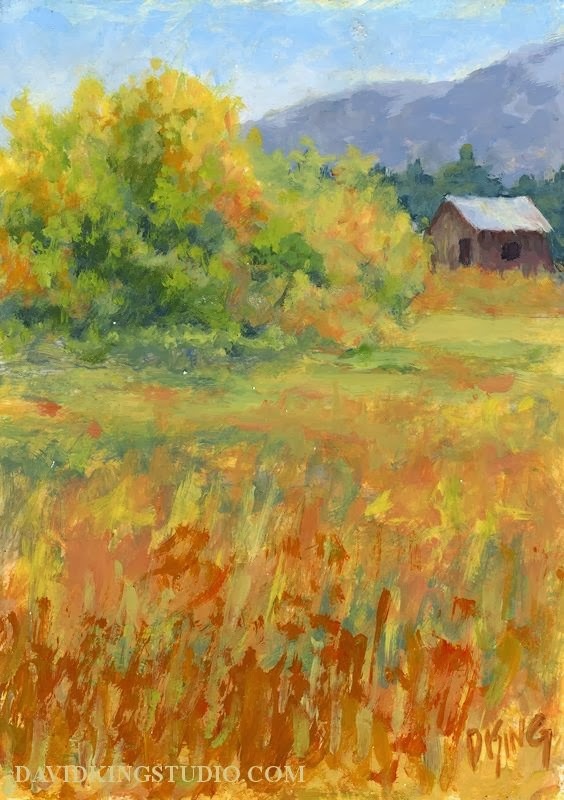 Of course "October Field" reflects the vibrant colors of fall, everything from yellow-green to bright orange and red. The only other differences are minor details that help support the main idea and add a little interest. These paintings were all painted in my studio using photos that I took in or near Eden, Utah as reference.